Instagram has made it official. Rihanna’s family means the world to her and she is never afraid or ashamed to show them off. The original bad gal, Robyn ‘Rihanna’ Fenty is all about the Instagram Top 9. So let's judge her by hers. Known for her variety of hairstyles over the years, in 2016 RiRi rocked faux locs and surprise, surprise that look was featured most in her top 9 pictures. The “Buffalo $soldier” according to her, was up front and center. But her locs were not the only repeat item captured, in five of the nine images Rihanna was with one of her family members. 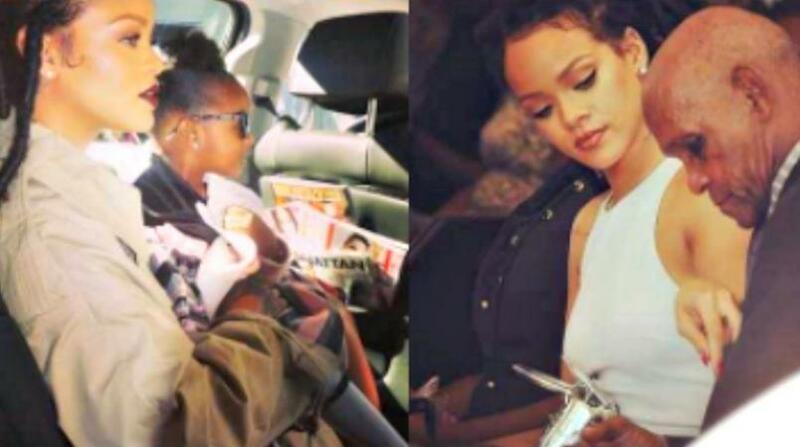 Aunty Oh Na Na was seen with her cute niece Majesty on three different occasions and in one photo when RiRi has Majesty up in her arms, she said that they were off to Majesty’s nail appointment. When Rihanna visited Barbados for her cousin’s baby christening back in November, 2016, she snapped a pic with her grampa and tagged it simply ‘Family’ and that photo appeared in her top photos. But previously on Instagram she has referred to her gramps as “Captain of the ship....my grandfather #Bravo," and she added, "Such an inspiration to the 4 generations that came after you (so far) and as a result of you!” Still batting strong, on his last birthday, RiRi saluted grandpa saying, “I love you with all my heart, and I'm so happy that God spared you to see the 88th year of your life!!! Rihanna and her mum also made the top 9. The lights are out and her mum, Monica Brathwaite, is in the background of the photo bathed in the glow from her cell phone, and RiRi captioned the pic, “caught mumz Insta-lurkin”. Rihanna spent Christmas 2016 with her family and close friends at home in Barbados but has since jetted to London for New Year’s Eve and landed in New York last night to continue that Rihanna reign. 2017, no letting up it seems!